Одним из самых важных направлений производственной мебельной компании «АРТ-Дизайн» (Санкт-Петербург) является проектирование, изготовление, сборка и монтаж на адресе мебели под заказ по индивидуальным проектам: шкафы - купе, раздвижные двери купе, гардеробные комнаты, кухни, детская мебель, офисная мебель и мебель для гостиниц. Мебельная компания «АРТ-Дизайн» образована в 2000 году в Санкт-Петербурге. На сегодняшний день в ней работает более 80 сотрудников. Если в конце 2000 года компания «АРТ-Дизайн» представляла собой небольшой цех по производству мебели на заказ, то сегодня это одно из перспективных и динамично развивающихся мебельных организаций Санкт-Петербурга, успешно работающая на мебельном рынке Санкт-Петербурга и Ленинградской области более 12 лет. To date, cases - compartments most optimal type of furniture, harmoniously fit into the modern interiors of apartments, homes and offices. Cabinets - compartment to order more desirable for a buyer than ready cabinet’s coupe sold in stores, so they are aware of all the individual characteristics of the premises and the needs of customers, enabling us to wisely use their internal space. 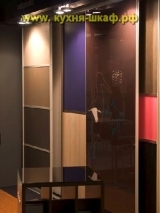 Cabinets coupe custom designed strictly to the parameters particular room take into account the future of their appointment with the internal content, maintain the harmony of colors cabinet material and decoration. Cabinets - compartment to order from the manufacturer are also a lot of colors of materials, making the execution of style and the materials and fittings. All this makes the cabinets - compartment to order furniture versatile piece to add to any interior space novelty, aesthetics and unique, because it is made exactly according to your wishes. Original decision manufactured cabinets are built-in corner cabinets - coupe, which not only maximize the use of the free space of the room, and gently smooth the interior angles. Built-in corner cabinets - coupe - a promising direction of modern design and interior furnishing an apartment or house, as they save a large area of storage space room or hallway, and have an optimal configuration of your convenience. Built-in corner cabinets - compartment to order a large range of different designs and materials exterior, frosted glass or mirror in the door compartments allow achieve the effect of increasing the space area, so you can stick the mirror on the side cabinet, in addition to a visible increase in the room will ease cabinet design. In terms of functionality, the internal content and ease of use built-in corner cabinets - not inferior to conventional coupe compartment case, even in the majority of cases are even more affordable alternative to conventional cabinets, walls and furniture for the hall. Furniture Company "Art Design" uses the latest high-tech equipment for furniture manufacturing, quality control of the products and their completeness in each production stage, which distinguishes our case - compartment, built-in cupboards and corner cabinets. Photos of the most popular design options and appearance cabinets to order you can see on the site for the manufacture of cabinets to order. You can see and appreciate the full range of our production catalog cabinets and choosing wardrobe, cupboard - coupe or corner cabinet, whose photo you like the most, to order by phone closet in our organization. After application on the phone to our professional designer or zamerschik furniture that will design a compartment, will help in the selection of furniture and stuff and tell you the final cost of cabinet compartment. Designing your order will be done before the arrival of pre-designer to adjust the on-site dimensions and filling and construction cabinet compartment. So, in your presence will consider all the nuances of the apartment interior and your wishes for the cabinet. Significant degree of automation and process of manufacture and the availability of professional artists’ producers, allow us to produce cabinets - compartment to order any custom solutions and design.